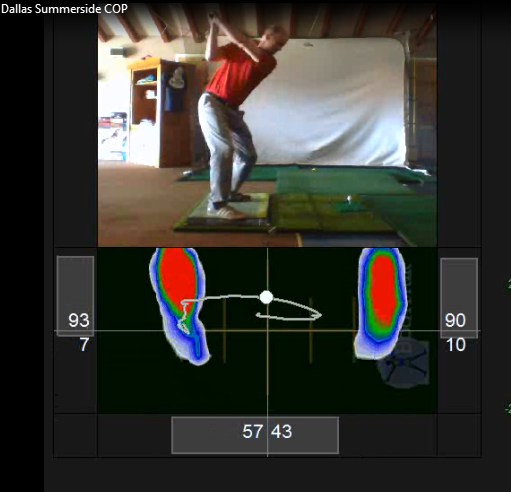 By capturing data on both the X and Y axis you effectively now can begin to understand the correlation between Swing Path and Weight Distribution. By using sound to capture impact we can now begin to explore the swing in terms of when the transition to the backswing occurs and time to impact. precipitated a cut tendency. I was sure that my set-up was perfectly balanced but BodiTrak showed me that this was off by over 20% - an 80/20 set up. There was no way for me to get to the right properly from this position and my move from the top was way off balance. It is amazing to us how difficult it is to self-assess subtle things like weight and balance. Once your habits are so ingrained that you just can not imagine what your pro is telling you and he can’t see or prove that there is a problem until you get on the BodiTrak mat. The other great thing about the mat is that it is so unobtrusive. Kind of like TrakMan - the Boditrak gives you feedback without interfering with your set-up or swing. We also think that the BodiTrak will be a great teaching aid for new golfers. Weight and balance are easy to describe but the immediate feedback should make learning the proper set-up and shifts needed much easier.